The one and only time I previously saw THAT LADY IN ERMINE was as part of a festival honoring director Ernst Lubitsch when I was a teenager. I remembered it as having beautiful Technicolor -- and being completely crazy. That impression still holds true. It's a wacky movie which is also fairly entertaining. It's almost impossible to describe the film, which includes ancestors stepping out of their portraits in an ancient castle...bizarre dreams...and Betty Grable, in a dual role, singing the loony "Ooh, What I'll Do to That Wild Hungarian." It's the kind of movie which inspires people who walk into the room midway through the film to exclaim "What on earth is this?!" It's the 1860s somewhere in Europe. Betty Grable plays Countess Angelina, whose brand-new husband (Cesar Romero) must flee immediately after the ceremony to escape an advancing army led by a Hungarian colonel (Douglas Fairbanks Jr.). Angelina is determined to save her castle from the colonel, just as her ancestor Francesca (also Grable) once protected the castle, but she doesn't count on falling in love with her enemy. Thanks to some magical assistance from Francesca, Angelina might end up with the right man after all. This was Lubitsch's last film; he died during production, and the movie was completed by an uncredited Otto Preminger. According to Scott Eyman's Lubitsch biography LAUGHTER IN PARADISE, the story, based on an operetta, was originally envisioned as a vehicle for Jeanette MacDonald, or Irene Dunne and Charles Boyer. Producer Daryl Zanuck cast Betty Grable in an attempt to broaden the types of movies in which she appeared; he also wanted to cast Cornel Wilde but -- happily for those of us who greatly prefer Mr. Fairbanks -- Lubitsch was able to get the freelancing Fairbanks instead. The movie is so zany one really wonders what exactly those behind the film were thinking when it was made! It does have some very funny dialogue mixed in with the crazier moments; there are also amusing running jokes with Fairbanks screaming for his aide (Walter Abel), or Romero repeatedly saying "To recapitulate..." Although the previously mentioned "Ooh, What I'll Do" is simply bizarre, "This is the Moment" is a lovely song. At times the film moves more slowly than it should, but it has its charms and should be seen by those who admire the director or the lead actors. The supporting cast includes Harry Davenport and Reginald Gardiner. The beautiful Technicolor photography is by the great Leon Shamroy. The movie runs 89 minutes. THAT LADY IN ERMINE has not had a video or DVD release in the United States. It has had a Region 2 DVD release in Spain. This film can be seen as part of the library at Fox Movie Channel. It is also listed as available to view online at Fancast. 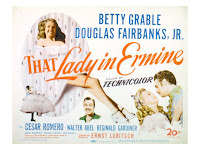 December 2012 Update: THAT LADY IN ERMINE is now available on DVD-R from the Fox Cinema Archives.